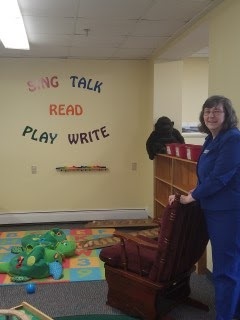 The Windham Public Library staff and town officials invited the community to a “Grand Reopening” Open House that included a large spread of refreshments on Thursday, April 12 from 4 p.m. to 7 p.m. to celebrate the recent library renovations. The event began with a welcome and opening remarks by Library Director, Jen Alvino and Town Manager, Tony Plante to a crowd of approximately 35 to 40 library patrons who were eager to see the new updates. Alvino expressed her gratitude to both the public for their understanding and patience during the renovation process, as well as to the Town Council and Town Manager for their support. Alvino pointed out that the new library renovations contributes extensively to better serve the community needs now and in the future. The many improvements that help better service the community include one larger circulation desk instead of two. The new desk is on the first floor to accommodate all areas of the library and it comes with an additional work room space. There is also a new counter area behind the circulation desk which provides the space for processing and delivery. This updated feature now expedites the delivery of books, CDs and other library materials to the patrons more efficiently. Children and teens are also benefiting from the renovations. The children’s room now includes and dedicates a space for infants and operates with a new, easy to follow system. 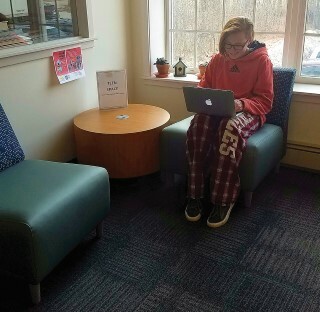 The second floor got a few of its own facelifts including a Maine Collections Room that comes with a table and four chairs for study, as well as a high back executive chair for reading. Another addition includes two private study rooms that can hold up to 4 or 5 people at one time. 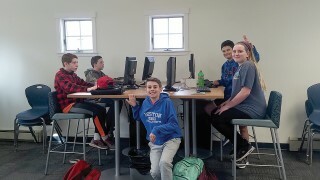 The three-hour open house was a success, with a steady stream of library patrons, including many of the Windham delegation, to look at the library’s makeover and the new services it is now able to offer.